Giardiasis, which is a protozoan infection in human, is caused by Giardia lamblia (synonyms as Giardia intestinalis or Giardia duodenalis). This disease is sometimes known as traveller’s diarrhoea, causing problems all around the world. The causative agent presents in two distinct forms: the disease-causing trophozoite and the dormant infectious cyst. This essay is to review the strategies employed by G. lamblia to complete its life cycle inside and outside the host. At first, the hosts (commonly are travellers) pick up G. lamblia cysts in contaminated food and drinking water. The person-to-person transmission also occurs via faecal-oral route. Outside the host, the parasite is relative inert when encapsulated in a tough cyst wall with its metabolism being down-regulated. The infectious dose of this organism is low, as few as 10 cysts are required to transmit the disease. Following ingestion, the cyst shreds off its wall, becomes metabolically active and grows into trophozoite form, by excystation. This is a rather dynamic process that takes only 15 minutes to complete. Instead of destroying the cyst, the acidic milieu in the stomach triggers excystation process. The activated cyst then encounters the slightly alkaline and proteolytic conditions of the duodenal-jejuna regions and starts rupturing as the cyst wall proteins are dephosphorylated. First pair of flagella projects out of the cyst from one pole, followed by an excyzoite body, forming an excyzoite which is a transient stage of the protozoa. The excyzoite then undergoes cytokinesis and karyokinesis to become trophozoites, which then replicate asexually by longitudinal binary fission. A trophozoite morphology characteristically appears as a tear-drop shaped smiley face with the 2 nuclei being the eyes when stained with Giemsa. [Figure 1]. It has 4 pairs of flagella that originate and exit the trophozoite at different places. The parasite lacks some eukaryotic organelles such as mitochondria, peroxisomes and Golgi apparatus. The trophozoites either move freely using their flagella or remain attached to the mucosa in the upper part of the small bowel. The attachment by its ventral sucking disc, which is a unique anatomical feature of the protozoa, allows G. lamblia to persist the peristaltic intestinal expulsion. G. lamblia possesses several protective mechanisms against host responses. One of them is antigenic variation (AV). The trophozoite is entirely coated with a dense single layer of variant surface protein (VSP). In the mucosal linings of the gastrointestinal tract, B cells secrete IgA antibodies that specific for these surface molecules and thus promote removal of the pathogen. However, VSP keeps changing all the time due to AV that allows continuous genes switching of this protein family. There are around 250 VSP genes in the parasite genome, but only one gene is expressed on the surface at any one time; except during the switching process as well as encystation and excystation. The switching occurs spontaneously every 6.5 to 13 generations, but this frequency can be altered and specific under certain immune stimuli and physiologic conditions. In fact, one type of VSP is gradually replaced by another every 12-36h. This rapid replacement lowers the probability of being caught and cleared by host immunity, hence increases the parasite’s viability. VSPs are extremely cysteine-rich type 1 integral membrane proteins. They comprise of multiple CXXC motifs, a Zn-finger motif, a conserved C-terminal membrane-spanning domain and an invariant cytoplasmic tail CRGKA motif. VSPs allow the trophozoites to thrive in the alkaline and proteolytic milieu of the upper intestine as they are relatively resistant to intestinal proteases and free radicals. In addition, the cysteine residues form intrachain disulphide-crosslinking on the membrane that add further protection against the host defence mechanism in conjunction with supporting trophozoite’s cytoskeleton. L-Arginine, which is a semi-essential amino acid, can be metabolised by several enzymes including nitric oxide synthase (NOS), arginase (ARG), arginine deiminase (ADI) and arginine dihydrolase (ADH). L-Arginine is needed for internalisation or re-expression of CD3ξ, a key T cell receptor chain that involves in signal transduction and reassembly of T-cell receptor complex (TCR). L-Arginine deprivation impedes CD3ξ functions and thus blocks T-cell activity. G.lamblia exploits this amino acid in different ways. It can use its own or host’s ARG to deplete L-Arginine and impairs T cell responses. In addition, the parasite converts L-Arginine to energy (ATP) using ADH. The Ca2+ dependent conversion of arginine to citrulline (citrullination) by ADI also contributes to this ADH energy making pathway. The ATP is then used for cell growth and metabolism. Even though this utilisation does not produce as much energy as glycolysis, but the reaction rate is way quicker; thus it is more efficient in energy production, especially when the mitochondria are missing. Furthermore, citrullination of the arginine residue in the CRGKA motif influences antigen variation during encystation. Giardiasis is often asymptomatic, and acute infection typically manifests after 1-2 weeks onset of incubation. The invasion mechanism and pathophysiology of G.lamblia are not fully understood. The classic immune responses with inflammatory symptoms are normally absent in Giardiasis. Low levels of IL-8, which are typically high in bacterial infections representing inflammation, has been reported during the infection. This might explain the lack of inflammation. Another idea is that G.lamblia actively dampens down the innate immune and inflammatory responses. They can be achieved by down-regulating nitric oxide and other free radicals production in the epithelium or by interfering with T cell function as mentioned. The trophozoites do not break the mucosa to enter the blood stream, but their attachment indeed reduces the surface area. In some severe cases, they may entirely cover the epithelial surface. This affects the ability to absorb water and nutrients of the intestinal epithelial. Digestive enzyme secretion is also compromised. Consequently, the host might suffer from malnutrition, excessive intestinal gas (from bacterial digestion of undigested food), and diarrhoea (as water is kept in the gut). The trophozoites may even travel up to the gallbladder, causing abdominal pain and jaundice. Eventually, intestinal contents carry the trophozoites to the colon where they develop into cysts by encystation. High levels of bile, cholesterol starvation and alkaline condition are supposed to be the stimuli for the process; yet the actual trigger remains unclear. In comparison with excystation, encystation is a slow process that takes up to 16 h to complete. Internalisation of flagella, fragmentations of ventral disc and cyst wall synthesis are seen in early encystation. Morphologically, the differentiating trophozoites round up. They gradually lose their motility and attachment. Cyst wall synthesis begins with the upregulated expression of cyst wall proteins (CWP). As yet, regulation of gene expression during encystation remains unclear. There are four recognised CWPs: CWP1, CWP2, CWP3 and HCNCp (high-cysteine non-variant cyst protein). The first three are leucine-rich repeat-containing proteins with positionally conserved cysteine residues, while the fourth resemble trophozoite VSP. Following the synthesis of these proteins is the formation of a large unique Golgi-like organelles called encystation-specific vesicles (ESVs). ESVs are the means of CWPs’ modification and transport to the cyst surface. Inside EVSs, there are enzymes that required for CWPs maturation, including three protein disulphide isomerases, a lysosomal cysteine proteinase and a Ca2+-binding granule-specific protein. Cyst wall is also composed of polysaccharide molecules, most of which are β-(1-3)-N-acetyl-d-galactosamine. They are synthesised de novo from endogenous glucose. The enzymes needed for this biosynthesis are transcriptionally and allosterically regulated. The intrachain interactions of these sugar components together with the linking between them and CWPs provide a tough, insoluble nature to the cyst wall. Inside the cyst body are all the proteins that later involved in excystation. The cysts are immotile, hypometabolic, yet infective; they will be later excreted with the faeces into the environment. The cyst wall protects the protozoan from hash conditions and allows it to persist for months outside the host. The cysts have been reported to survive chlorinated water, thus they are sometimes picked up from contaminated swimming pool. They keep wandering outside, waiting for the host to digest them. They are awaken from dormancy when passing the stomach and once again enter the protozoa’s life-cycle at excystation stage. Giardiasis, also known as traveller’s diarrhoea, is the gastrointestinal infection in human host caused by the protozoa G. lamblia. The parasite is found in two forms: the motile, non-infective, feeding trophozoite and the dormant, infective cyst. After ingestion from contaminated food or water, the cysts excyst into excyzoites and eventually trophozoites. The trophozoites inhabit on the proximal region of the small intestine and causing problems. When transit towards the colon, the trophozoites enter encystation to form cysts, which then are excreted into the environment, waiting for the next host to come and start the cycle again. To sum up, the parasite acquires several mechanisms to evade host immune responses for survival in order to complete its life cycle. When in trophozoite stage, these mechanisms include antigenic variation of VSPs, utilising arginine residues for its growth, dampening down mucosal immunity and many more. The strong adhesion to intestinal epithelium by ventral sucking disc also allows the protozoa to persist the peristalsis elimination of the gut. Finally, in cyst form, the cyst wall components provide a tough shield that protects the protozoan from harsh conditions outside the host as well as the acidic milieu when it first encounters the stomach. "Giardia Lamblia Life Cycle." UKEssays.com. 11 2018. All Answers Ltd. 04 2019 <https://www.ukessays.com/essays/biology/life-cycle-g-lamblia-2011.php?vref=1>. "Giardia Lamblia Life Cycle." All Answers Ltd. ukessays.com, November 2018. Web. 20 April 2019. <https://www.ukessays.com/essays/biology/life-cycle-g-lamblia-2011.php?vref=1>. UKEssays. November 2018. 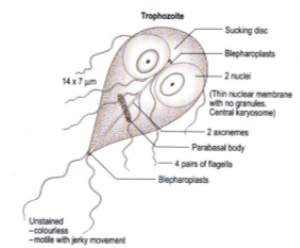 Giardia Lamblia Life Cycle. [online]. Available from: https://www.ukessays.com/essays/biology/life-cycle-g-lamblia-2011.php?vref=1 [Accessed 20 April 2019]. UKEssays. Giardia Lamblia Life Cycle [Internet]. November 2018. [Accessed 20 April 2019]; Available from: https://www.ukessays.com/essays/biology/life-cycle-g-lamblia-2011.php?vref=1.